Request former LT Murphy to speak at your corporate meeting, Veterans Group or other event. The USS Pueblo (AGER-2) is a US Navy ship that was sent on an intelligence mission off the coasts of the Soviet Union and North Korea in 1968. On January 23 of that year, it was illegally attacked in international waters by armed warships of the North Korean Navy. One Pueblo sailor was killed, and 10 others including the Executive Officer were wounde d. 82 crewmembers were captured and held prisoner for 11 months. 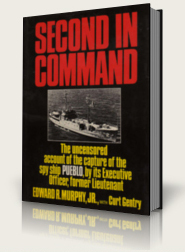 Second In Command is an uncensored and untold account of the capture of the USS Pueblo. It correlates the Pueblo compromise to the tide turning events resulting in the failure of the Viet Nam War’s TET Offensive. Second In Command corroborates the fact that the seizure of the Pueblo and the resulting devastating security compromises could have been avoided. The USS Pueblo is the only commissioned US Navy ship held today by a foreign power. It is the US Navy’s second-oldest ship still in commission. USS Pueblo (AGER-2) is a Banner -class technical research ship (Navy intelligence) which was boarded and captured by the Democratic People's Republic of Korea (North Korea) on 23 January 1968 in what is known as the Pueblo incident or alternatively as the Pueblo crisis or Pueblo affair .